Present there were members of the Presidium of the Political Bureau and members and alternate members of the Political Bureau of the WPK Central Committee. The meeting dealt with the organizational issue. The first thing that is striking about this announcement is that it focuses solely on Ri’s political appointments although his removal touched more importantly on military organization. Ri was exemplary of military officers who also held overlapping directorates in all of the top political bodies; in official rankings he was #5 behind Kim 3, Kim Yong Nam, Choe Yong Rim and Choe Ryong Hae. His prominence in the transition process was signaled by his inclusion in what we called The Gang of Eight: the eight figures—four of them military if we exclude Kim Jong Un and Jang Song Thaek—who accompanied Kim Jong Il’s bier. But Ri was also what we have called a "military military"man, someone who actually had an impeccable military pedigree and was not simply parachuted into top positions (see North Korea Leadership Watch for a bio.) The son of Ri Pong Su, a partisan who fought with Kim Il Sung and a former Minister of Justice, Ri’s rise through the ranks was clearly blessed from on high. In 2003 he was appointed commanding officer of the Pyongyang Defense Command, a pivotal position in the military for quite obvious reasons and one typically held by officers with close personal ties to the Kims. In February 2009 he was appointed Chief of the KPA General Staff, in effect head of the country’s war-time operations. At the time of the 3rd Party Conference in 2010 he was both promoted to Vice Marshal and also ascended into the Politburo Presidium—apparently with support from Jang Song Thaek—over several officers with more seniority. The second point to make is that while illness could possibly be the reason for his dismissal, the nature of the announcement, the level at which the decision was taken and the explicit mention that the meeting dealt with “the organizational issue” constitute a major signal: the last such meeting of the Politburo that we know of was last June following Kim Jong Il's visit to China. This looks like a purge to us. The third point to make is that Ri’s replacement as Chief of the KPA General Staff has nowhere near the heft of his predecessor. Hyon Yong Chol had been promoted to 4-star general before the September 2010 Party Conference—he was head of the 8th Army--and was made a full member of the Central Committee. But he was ranked only 83rd on the Jo Myong Rok funeral committee list in November 2010 and 77th on Kim Jong Il’s funeral committee. Now, he holds the title of Vice Marshal as a result of a decision of the Central Military Commission and National Defense Commission; he has clearly risen quickly within the ranks. But as of this writing, there is no indication yet that he has assumed Ri’s positions on the Politburo Presidium and Central Military Commission, although he ultimately may. Moving from what we know with somewhat greater certainty, we should at least report the leaks coming out of the South Korean intelligence community that the removal of Ri did not go smoothly. The Chosun Ilbo cites South Korean intelligence that the dismissal was not via your old-fashioned pink slip. Rather, Vice Marshal Choe Ryong Hae, the director of the People's Army General Political Bureau and considered an acolyte of Jang Song Thaek’s, was given the task of overseeing Ri’s detention. Guards protecting him fired back, reportedly leaving 20-30 people dead. Major Western news sources have picked up on the story (for example, ABC News and The Telegraph). But even more interestingly, the KCNA felt constrained to complain about the vicious lies the press were spreading on the succession. Luke Herman has already parsed several different theories and we tweak them a little more here. These theories are not mutually exclusive, but they emphasize different facets of the opaque North Korean political game. Policy disagreements. A variety of theories have surfaced about possible policy differences within the elite. NightWatch suggested that Kim Jong Un wanted to move in a less bellicose direction. Economic disagreements have also surfaced within the leadership, including (according to Nicholas Hamisevicz at KEI) over the role of the military in economic reconstruction projects; Kim Jong Un favors it; Ri and the military apparently didn’t like it. Struggles over rents. A particularly intriguing theory is provided by Choe Sang-Hun at The New York Times. Citing refugee testimony, Choe claims that deep divisions have arisen over the military’s control over the export sector, and thus over scarce foreign exchange. Kim Jong Un wants to claw that back either to the leadership or to the cabinet and planning process. The succession. Our favored theory is that this is all about the succession. Any succession inevitably raises the issue of whether the new leadership can count on the generals and security apparatus. Better to have in place the people that you have appointed than the people that others have placed there. As can be seen, there was some meaningful turnover in 2003-4 and Kim Kyok Sik became Chief of the KPA General Staff in 2007. But since the transition began in earnest, turnover in these positions has been coming fast and furious. First, Kim Jong Il tried to install a transition team for his son and then—with Kim Jong Il gone—Kim Jong Un and his allies had to place their own bets. This does not speak to the misguided question of whether “Kim Jong Un is in charge”; no one rules alone and he clearly has his own coalition of support. But the point is that this coalition could solidify its grip on power only by eliminating others who commanded real resources. Put differently, Ri is not alone. 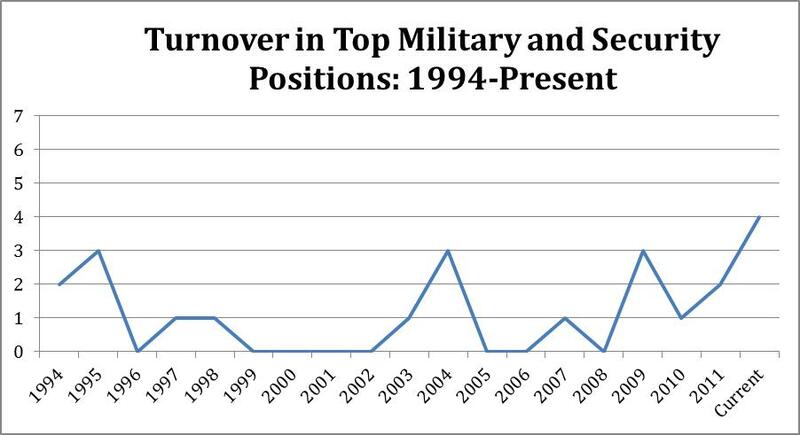 The Table below names names, looking at turnover in these top military positions since 2009. Some of the names on this list remain important players in the new regime; their removal occurred only because they were taking on new responsibilities. Kim Won Hong moved from Military Security Commander in 2009 (or 2011; there is some confusion) to become Minister of State Security. Kim Jong Gak was the First Vice-Director of the KPA General Political Bureau. Instead of being promoted to Director, he took over as Minister of the People’s Armed Forces from Kim Yong Chun. However, many of the others on the list were either transferred to lower-ranking posts or removed altogether for “illness.” Among the former are: Kim Kyok Sik, former Chief of the KPA General Staff, who was removed and assigned command in the Western Region (and may have overseen the Yeonpyeong Island shelling); Kim Yong Chun, former Minister of the People’s Armed Forces, who is now Director of the Party Civil Defense Department, a significant downgrade; and Kim Il Chol, demoted to First Vice-Minister of the People’s Armed Forces and eventually “retired” a year later due to age (despite the fact that there were other officials older than him that kept their positions). Among those removed for “illness” we have in addition to Ri Yong Ho Ju Sang Song, former Minister of Public Security. Ju’s removal is interesting not just because he was a member of the Politburo and NDC but because he was replaced by a stalwart supporter of the Kim’s (and a true military man) Ri Myong Su. Some mystery surrounds U Tong Chuk, the First Vice-Minister of State Security, who was an alternate member of the Politburo, member of the NDC, and one of the “Gang of Eight” who accompanied Kim Jong Il’s funeral bier. After the April Party Conference, when he did not retain either the Politburo or NDC post, it seemed like he may have been a goner. However, Ken Gause in his excellent report for HRNK believes he may have just been keeping those Politburo and NDC spots warm for a more permanent replacement (Kim Won Hong), and he is still in the position of First Vice-Director. One interesting fact is that the Guard Command has shown much less turnover, having only two Commanders since 1984 (Ri Ul Sol from 1984-2003, Yun Jong Rin since then). The Guard Command is like a beefed up Secret Service; it provides security for the Kim family and other high-ranking government officials among other duties. Clearly the Kims have been cautious about who they select for this position and have a great deal of trust in their choices. In short, the decision was issued in the name of all of the important political bodies. This one is a little easier to explain. The title of Marshal of the DPRK is higher than a mere Marshal of the KPA, and was held only by Kim Il Sung and Kim Jong Il. (There are two Marshals of the KPA: Kim Chol Man and Ri Ul Sol, both of whom are over 90 and no longer players). At least at the titular military level, K3 now joins K1 and K2 and there can be absolutely no doubt about the military pecking order. At the celebration of the new appointment, we also learned for sure that Hyon Yong-Chol has been appointed chief of the general staff of the KPA, since he offered his congratulations in that capacity. In sum, we still don’t see serious signs of stress. Indeed, if Kim Jong Un can fire generals, even if 20-30 are left dead in the process, then it strengthens rather than weakens his hand by sending the signal in blood: don’t mess with K3. One minor fix - we said that only Kim Jong Il and Kim Il Sung had been Marshals of the DPRK. A friend tells me that O Jin U, former long-time Minister of the People's Armed Forces, was also a Marshal of the DPRK. Thanks so much for the interesting blog. It occurred to me that Ri may have been made the scapegoat for the failed missile launch of April 2012. This also ties in with Kim3 wanting to have his own people in key positions. Best Regards.